During the summer of 2016, the URG conducted a human rights-based assessment of the candidates competing to fill the post of UN Secretary-General. 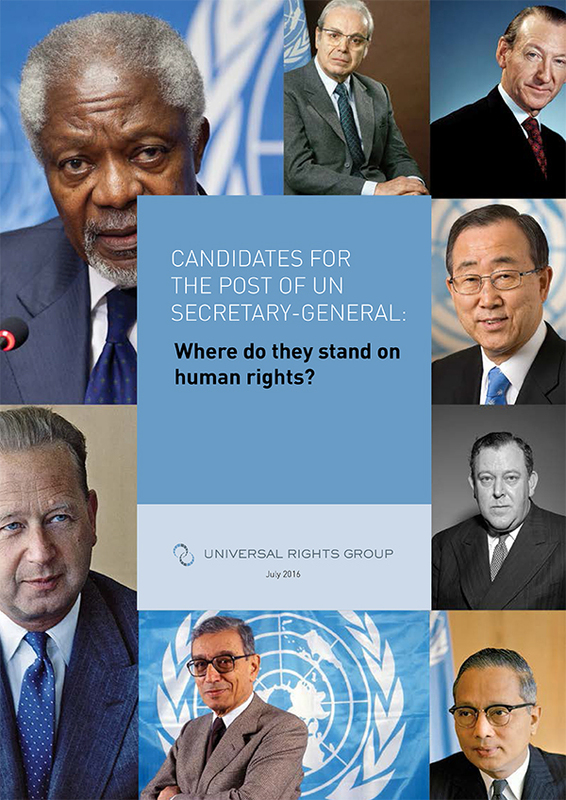 A new policy brief on: ‘Candidates for the post of UN Secretary-General: where do they stand on human rights?’ presents an overview of the selection and appointment procedure of the UN Secretary-General, and a summary of each candidate’s experience, commitments, and pledges/vision in the area of human rights. Because human rights is one of the three pillars of the UN system, it is vital that States take this information into account when selecting the best individual for this vital post. The Secretary-General is appointed by the General Assembly, upon the recommendation of the Security Council. The selection and appointment process of the UN Secretary-General has been the focus of regular criticism over the years, due to its lack of transparency and inclusivity. Although the formal inter-governmental decision-making process has not changed, this year, for the first time, reforms have been introduced to open the process up to wider participation and scrutiny, by, inter alia, asking the candidates to provide vision statements, convening informal dialogues and ‘town hall’ meetings, and allowing civil society and the media, in addition to States, to engage with the candidates. As a contribution to that process, URG’s new policy brief offers an assessment of where each candidate stands on questions of human rights. It does so by analysing their vision statements, their experience, their speeches and responses to questions during the informal dialogues, and their comments during the July ‘town hall’ meeting. The policy brief also explains the reformed appointment procedure, and analyses the degree to which scrutiny, questions, and statements have focused on important human rights issues (including thematic issues, and institutional issues related to the Human Rights Council and its mechanisms and programmes).